(HARLINGEN) – Daniel Avila recently shared with a room full of his classmates, their families and friends that he first realized he wanted to become a nurse when his son was in the neonatal intensive care unit after he was born. “Author Mark Twain once said, ‘The two most important days in your life are the day you were born, and the day you find out why,’ and this is when I found my why,” he said. 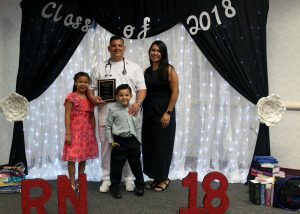 Now six years later, Avila found himself telling his story as the salutatorian of the first registered nursing cohort at Texas State Technical College during the program’s first pinning ceremony. So the Avila family sold their possessions, moved in with Avila’s mother-in-law, he left his job as a customer service representative with United Health Care and went back to school. The 26-year-old and father of two first graduated with a certificate as a vocational nurse from a local community college, but found himself left out of the registered nursing program three years in a row. After speaking with a friend, who told him about TSTC’s vocational nursing to registered nursing transition program, Avila called Shirley Byrd, the program’s director, and found out he had only 24 hours to take his entrance exam and apply. Avila first became a nurse to work in the NICU, but along the way he found a new passion: working with cardiac patients. He has accepted an offer at Harlingen Medical Center in the Cardiac Care Unit and will start as early as September 1, contingent on him passing the National Council Licensure Examination. Avila is one of 29 TSTC registered nursing students who recently graduated and pinned into the profession. The pinning ceremony is a tradition the program will follow annually and dates back thousands of years. It is a rite of passage that represents sacred healing and the commitment to caring for others and the official welcoming into the profession. 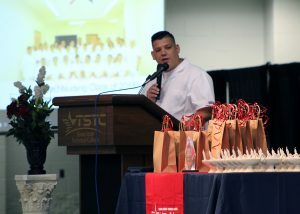 Perfect attendance awards, registered nursing club officer awards and student leadership awards were also presented. For more information the vocational nursing to registered nursing transition program at TSTC, visit tstc.edu.